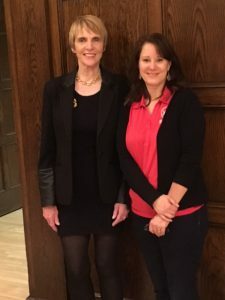 Humorous inspirational speaker, author and standup comic Marti MacGibbon delivered a keynote speech at Iowa State University Memorial Union on September 13th. The event, “An Evening of Healing and Hope: Laughter is the Best Medicine, was part of National Recovery Month, and the University’s lecture series, and was organized and sponsored by Youth Shelter Services, a mental health provider in Ames, Iowa. Marti’s talk focused on hope, resiliency, and empowerment when overcoming adversity and challenges. She provided down to earth strategies for self-empowerment and motivation, and personal insights into mental health, trauma recovery, and addiction recovery, using stories to illustrate talking points. In the face of the current addiction epidemic which has claimed the lives of so many young people, Marti’s message is especially important. Ms. MacGibbon also signed copies of her nationally award-winning memoir, Never Give in to Fear: Laughing All the Way Up from Rock Bottom. The event was covered in the Iowa State University press. 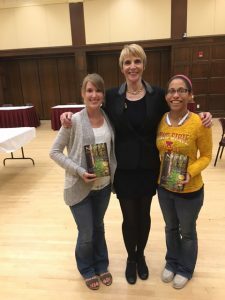 Marti MacGibbon, at ISU/YSS book signing with audience members. Marti MacGibbon with event planner Jill Hill of Youth Shelter Services, at ISU.